The People’s Choice winner, the Editor’s Choice winner, and other entries in the fretwork portrait category. 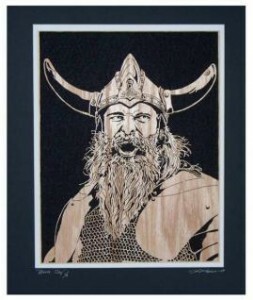 Battle Cry by Kerry Hallam earned both the People’s Choice and the Editor’s Choice in the fretwork portraits category. Kerry Hallam of Sumter, S.C., used a photo of a medieval reenactor as a basis for this design. The original photo was taken by Dan Landrom at the Washington Renaissance Festival. Kerry received permission from Dan to create a pattern based on the photo and enter the design in the contest. It took Kerry a week and a half to create the pattern and 20 to 25 hours to cut. Kerry stack cut three blanks and finished this oak plywood version with two coats of semi-gloss polyurethane. Black felt is used to back the portrait.